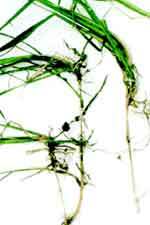 Titan Ltd has something that only a few other tall fescues have, an extensive rhizome system. These horizontal underground stems or rhizomes spread out to bare spots and send out new shoots and roots which aid in quicker repair and the ongoing thickening of the turf stand. So even when Titan Ltd. gets knocked around some, the rhizomes constantly act as self-repairing tools, ready and willing to create new plants when needed. Nearly a decade ago, work began on collecting individual plants throughout the country. They were specifically looking for tall fescue plants which had excellent heat and drought tolerance, resistance to diseases, dark green color, high turf quality, and a compact, upright growth habit. Selected plants from these collections were sent to Missouri where they were intentionally infected with six strains of the nasty disease commonly known as brown patch. Only those plants exhibiting excellent resistance to brown patch, heat tolerance, and stress tolerance were carried through to the next stage. Once the breeders had great looking, combat-ready plants, they chose to add three other special characteristics: slower growth, softer leaves, and denser stand. They knew the perfect lawn would be one that was not only tough enough to survive, not only pretty enough to look at and touch, but one that would require less mowing. So, after a multitude of further selections and crossings, they did just that. In fact, according to the 2003 NTEP (National Turfgrass Evaluation Program) Report, Titan Ltd. had one of the shortest canopy heights. Plant in the spring or fall. Prepare the soil by spading or tilling 4" — 8" deep. Incorporate fertilizers, then rake and level. Sow seed evenly at a rate of 7 — 10 pounds per 1000 square feet, 250—300# per acre. Rake lightly and cover with 1/8" — 1/4" layer of organic mulch. Water thoroughly and keep seed moist until it germinates and grass is established. Titan Ltd. performs best at mowing heights of 2.1" — 2.5". Underneath each Titan Ltd. plant is an extensive roots system that goes down deep, way deep— many times as deep as 6'! That means Titan Ltd. plants can access nutrients far below the surface. It also means you’ll have a tough time tearing it up with foot, or wheel traffic. 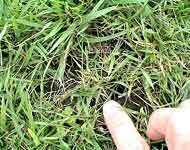 Sometimes tough play, a neighborhood dog, or some bad disease may come through and wipe out a few plants, potentially leaving your lawn with bare spots. Here’s where the real secret of Titan Ltd. comes into play: Titan Ltd has something that only a few other tall fescues have, an extensive rhizome system. These horizontal underground stems or “rhizomes” spread out to bare spots and send out new shoots and roots which aid in quicker repair and the ongoing thickening of the turf stand. So even when Titan Ltd. gets knocked around some, the rhizomes constantly act as self-repairing tools, ready and willing to create new plants when needed.